What else can I expect from an online Master's in English and Creative Writing program? Today, creative writers have opportunities to write for various platforms. According to the Bureau of Labor statistics, the median salary for a writer in 2016 was $61,240. A degree in creative writing prepares students for work as fiction writers, script writers, content writers, and academics. 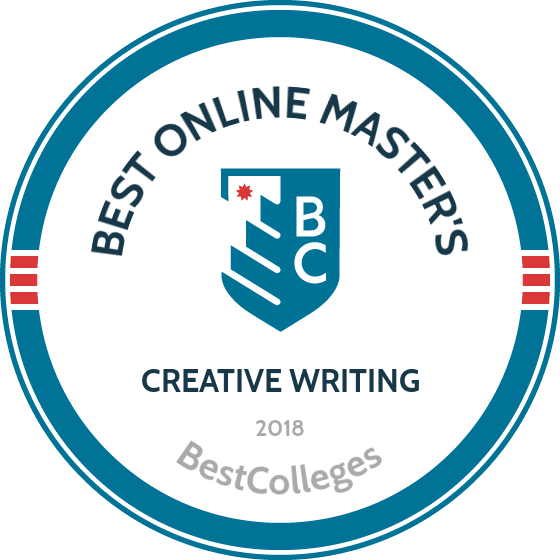 Below, we've ranked the best online master's degree in English and creative writing programs, highlighting creative writing programs that are attractive academically and financially. Creative writing programs strengthen students' writing skills using proven techniques. Many programs offer concentrations in fiction, nonfiction, poetry, or screenwriting. Beyond basic writing skills, creative writing programs teach students about character development, plot structure, and the craft of editing. Students also learn about the writing industry and how to pursue careers as writers. Graduates have careers as authors, historians, screenwriters, journalists, and more. Applicants must have a bachelor's degree, preferable in English or creative writing. However, work experience is not necessary. The best online master's degree in creative writing and English programs list prerequisites on their websites. Experience in the field is helpful, but students can apply immediately after obtaining their undergraduate degree. Research and preparation are key to finding the right online creative writing program. Applicants should thoroughly research institutions before applying to an English master's degree online program. On the department's website, students can find an overview of the program, including the curriculum, learning outcomes, tuition, and fees. Meet with an admissions counsellor for in-depth information and to ensure you meet the program's prerequisite requirements. CAN I WORK WHILE I COMPLETE MY ONLINE MASTER'S IN ENGLISH AND CREATIVE WRITING? Online master's in English programs are designed to be flexible and accessible for working students. Most programs allow students to complete coursework anywhere and anytime, as long as they have internet access, which is extremely beneficial for learners with personal and professional commitments. Most online degree programs require 15 to 20 hours of work per week, which is less time than in-person programs require. Founded in 1636, Harvard is an Ivy League institution located in Massachusetts and known over the world for academic excellence. Harvard’s master's of liberal arts in literature and creative writing is a hybrid program, wherein students complete coursework both online and on campus. Admission into the program requires prospective students to complete a proseminar in research methods and scholarly writing along with a creative writing course and another creative writing or literature course, all taken at Harvard. Once admitted into Harvard's master's in creative writing program, students complete coursework in advanced fiction writing, creative writing, and literature. Additionally, they must fulfill a thesis requirement. The program’s workshop method of learning requires students to take at least three of their courses on campus. Available writing and literature course topics include Irish myths, playwriting, and suspense fiction. Students have up to five years to complete the program, and need a 3.0 minimum GPA to graduate. Located in Missouri, Lindenwood features undergraduate and graduate degrees designed to produce well-educated, responsible global citizens. The university's distance learning programs offer academic rigor, flexibility, affordability, and convenience. Lindenwood's 48-credit master's of fine arts in writing is an accelerated program that students can complete 100% online, though some classes are available on campus. Students in this online MFA in creative writing participate in intensive craft courses, literature courses, and workshops on genres such as fiction, the novel, scriptwriting, and narrative journalism. Students are not required to declare an area of emphasis and can study multiple genres. Experienced writers who are published authors, editors, and journalists serve as instructors, and the program boasts small class sizes of no more than 14 students. Available student support services include academic counseling and financial aid. To apply for admission, prospective students must submit a writing sample and a statement of purpose. Serving fewer than 5,000 students, Wilkes is a small college with big impact. The Pennsylvania-based institution delivers 42 bachelor’s and 25 master's degrees rooted in the liberal arts and career preparation. Wilkes offers graduate programs online, in fields like education, nursing, and creative writing. The university's online MA and MFA in creative writing assembles a community of writers where students receive one-on-one assistance in the creative process. Faculty mentor students in a range of genres, from young adult and thriller to science fiction and playwriting. The program is distinct from other online creative writing programs due to its two delivery options: the "weekender" option allows students to take their courses online with four weekend sessions per semester. Students who choose the low-residency option attend eight-day residencies on campus in June and January. The primary consideration for admission to the program is a 15-25 page writing sample. National prides itself on providing students with a personalized educational experience that's convenient and flexible. The California-based institution administers 120 undergraduate, graduate, and certificate programs, offering 90 degree programs 100% online. Among National's online degrees is the master's of fine arts in creative writing, in which students produce and refine creative work in fiction, creative nonfiction, screenwriting, and poetry. Throughout the program, students participate in online workshops, develop constructive critiques, and engage in generative writing sessions guided by established writers. Students must produce a culminating thesis in their chosen genre with faculty mentorship. The program is ideal for those pursuing professional writing or publishing careers, those seeking to teach creative writing, or aspiring filmmakers. This MFA online creative writing program has no residency requirement. Admission requirements include a 20- to 30-page portfolio (of fiction or nonfiction), 10-20 pages of poetry, or a completed screenplay. An online master's in English and creative writing will include syllabi, assignments, projects, and discussions. Many online programs use discussion boards to help students interact, and students can speak to instructors through email, chat, or phone. Below, we outline common features of online English and creative writing programs. All master's degree in creative writing online programs require a certain number of credit hours. Required and optional courses vary by program, but below is a sample curriculum. Story and concept: This course delves into story development. Students create detailed outlines, plot arcs, and character sketches. Students also study fiction works from past and present and develop techniques to strengthen their literary effectiveness. Fiction fundamentals: Students learn how to effectively use imagery, symbolism, and tone. Students examine the key differences between fiction writing and other forms of creative writing, such as nonfiction, screenwriting and poetry. Graduate studies in literary theory: This course covers literary theory as it pertains to the human experience. Students explore ideologies that have shaped the world and how they have affected modern writing and critics interpretations of literary works. HOW LONG DOES IT TAKE TO GET AN ONLINE MASTER'S IN ENGLISH AND CREATIVE WRITING? The length of an online master's degree in English and creative writing is determined by the credit hour requirements. Typically, an English master's degree online program takes two years to complete. Transfer credits and student pace can affect completion time. Students in self-paced programs work asynchronously, completing assignments at their own pace. They may speak to the instructor if they have questions, but self-paced students complete the majority of the work by themselves. Online students often interact with instructors and peers through email and discussion forums. Many online programs use the cohort format, in which groups of students work together to complete assignments. The primary difference between regional and national accreditation is the type of schools these agencies work with. National accreditation is reserved for vocational or trade schools, while regional accreditation is for public and private postsecondary institutions. Credits from regionally accredited institutions are transferable, and degrees from these schools are held in high esteem. However, regionally accredited schools can be costly. Six U.S. agencies oversee regional accreditation. Agencies that monitor nationally accredited schools focus on programs and standards that prepare students for the workforce. Nationally accredited schools tend to be inexpensive, but they may not be widely recognized. These programs are reviewed every three to five years to monitor academic standards. The U.S. Department of Education manages government funds given to public and private institutions throughout the country and oversees adherence to federal laws and regulations. The Department of Education works closely with the Council for Higher Education Accreditation (CHEA), which handles accreditation policy and procedures. The CHEA has thousands of members from the postsecondary education community, who attend annual conferences and recommend accreditation policies. For a list of accredited institutions, visit the CHEA website. A bachelor's degree in English or creative writing is ideal for aspiring writers and authors. The best online master's in English and creative writing programs help students develop the skillset of an experienced writer, as they gain experience through projects and internships. The employment rate for graduates of English master's degree online programs is growing; graduates pursue careers in the communications, journalism, and writing industries. There are many writing disciplines, and creative writing graduates have a wealth of career options within the writing industry. The chart below details salary trends for copywriters, English teachers, journalists, and content managers. Graduates of online master's degree in English and creative writing programs work in industries such as entertainment, media, and publishing. In entertainment, graduates can join a team of writers to create scripted series, movies, and commercials. Copywriters work as marketing and advertising executives. Graduates may also become full-time novelists or English teachers. Authors create written works, such as essays, short stories, and graphic novels. Their work is published and can be found in bookstores and libraries. English teachers help students improve their reading, writing, and comprehension skills through the study of classic and modern literary works. Screenwriters create scripts for web and television series. Their characters and plots are viewed by wide audiences. Journalists create nonfiction articles for publications such as magazines and newspapers. They conduct interviews and research story developments. Copywriters create engaging content for print and digital mediums. They work within the marketing department to promote a brand's products or initiatives. Networking is vital in the writing industry. Writers can join professional organizations while they are in college or any time after graduation. Membership provides access to networking events, conferences, job boards, and job counseling. Professional organizations help writers negotiate fair wages and seek legal counsel during disputes. Below are a few well-known organizations. This union supports freelance writers and journalists, working to ensure writer's rights are protected and that they are paid. This nonprofit organization was created in 1934 to support the work of American poets. It offers members a monthly newsletter, cash prizes, and teaching materials for educators. This network of historians, poets, and journalists advises members on fair contracts and provides copyright information and legal services. The Department of Education provides loans, grants, and scholarships to help students finance graduate education. Students will need to complete the online Free Application for Federal Student Aid (FAFSA) to ensure they qualify for government funding. Special payment assistance programs are available for government workers and military personnel.